Much has been written about the deeds of our Khans and important personalities in various periods of Iranian history but not enough about the origins of this great family. As regards to the name of "Bakhtiari", it is not known for certain the origin of the name although many speculations exist and the oldest written reference to them are by Herodotus who refers to the tribe and their origins. Some scholars believe that the name is derived from "Baktrians" who were the Parthians living in North-East of Persia but this speculation has been refuted as to the unlikely geographical domain. Greek historians who have given accounts of Alexander's marches, refer to the inhabitants of the plain of Khuzistan and Susiana as Elymais or Elamites and describe an independent race of mountaineers called the Uxians. It is probable that while Elamites were established in the plainer portions, the Uxians who may have been the ancestral race of the later Bakhtiaris, held the mountainous territories1. One of the earliest mention of them is also by the Greeks who called them "Bakteris" which some speculate is derived from the Persian word of "Bakhtaris" meaning literally, People of the West. Bakhtiaris indeed dwelled in the Southwestern part of the country. Bakhtiaris occupy the mountain tract in South-West Persia lying roughly between longitudes 31 to 34 N and 48 40' to 51 E, bound on the south by the plains of Khuzistan and on the north by the districts of Chahar Mahal, Faridan, and Khonsar where the central Iranian Plateau blends into the great southern mountain range. Bakhtiaris were semi-nomadic and their livelihood depended on the survival of their herds of sheep, cattle, and horses. Migration of the tribe in search of greener pasture by crossing over the great snow-clad mountains of Zard e Kuh and braving the icy rivers while carrying their worldly possessions, have been subject of books and films. Merian Cooper in "Grass", published in 1925, captures the best-known account of such migration vividly in picture and text. The Bakhtiari tribe falls into two main groups, Haft Lang and the Chahar Lang. The Haft Lang predominates both in numbers and importance and comprise of several tribal divisions. 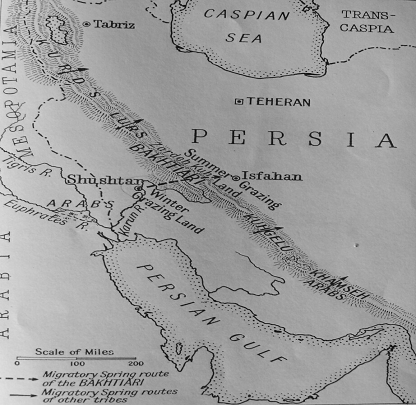 The four main tribal divisions of Haft Lang are Duraki, Babadi, Bakhtiarwand, and Dinaruni.2 For further information regarding the history and social organization of the Bakhtiari, Lord Curzon's Persia, and Sir Arnold Wilson's "The Bakhtiaris" published in the Journal of the Central Asian Society, 1926 are valuable sources. Further references are the Kitab i Tarikh e Bakhtiari compiled under the direction of the distinguished Bakhtiari chief, Haj Ali Gholi Khan Sardar Asad. Colonel Oajan Bakhtiari and Eskandar Khan Akkasheh have also written on the origin and history of the Bakhtiaris but mostly about internal strife and local skirmishes amongst the tribes. Similarly the memoirs of Sardar Zafar Bakhtiari contain reference to the origins of the tribe and description of tribal battles. Professor Gene Garthwaite's "Bakhtiari Khans" is a most valuable source of reference and so is his "Khans and Shahs". Etymologically, the language of Bakhtiaris originates from ancient Persian according to some scholars, and from Pahlavi language according to others. It is one of a group of Persian dialects extending geographically along the mountain tract from Pusht-e-Kuh on the west to the Kuhgiluyeh and Mamasani territories on the east and in main part untouched by the influx of Arabic words and therefore very close to old Persian. Many prominent explorers have written accounts of their travels through Bakhtiari territory and their encounters with the Khans. Major Sir Henry Rawlinson published the account of his journey in 1839. Sir Henry Layard traveled to Bakhtiari on his way to Afghanistan in 1840 and befriended the great Khan of Char Lang, Mohammad Taghi khan. Layard remained in Bakhtiari for two years and wrote about it in his 2 volumes of "Early Adventures in Persia, Susiana & Babylonia". In 1841 the Baron de Bode, First Secretary of the Russian Legation in Tehran, traveled to Bakhtiari and met with Layard in Ghaleh-Tul and traveled together to Malamir and in 1845 he published the account of his journey in "travels in Luristan and Arabistan, London, 1845". Another notable traveler who chronicled the account of his journey was Henry B. Lynch in 1890. Most of these accounts describe the geographical terrain, historical artifacts, ancient monuments and inscriptions. They also noted the conditions of access roads through the territory and reported them mostly to the Government of India's Political Office. Although one can trace references to the union of the Bakhtiaris as early as the 14th Century, there is no continuity of details and available facts from that date forward. One thing however is certain and that is the formation of temporary unions or confederations during times of outside threats and danger. Such outside dangers were at times from the central government and at other times, from neighboring tribes. Bakhtiaris would then form such unions for self-preservation and common defense very much like military pacts amongst neighboring countries of today against common enemies. The first confederation of the Bakhtiaris and the union between the Haft Lang and Char Lang was formed during the reign of Shah Abbas the 1st and continued to the time of Shah Abbas the 2nd. There are indications however that such union was weakened and eventually fell apart during the reign of Nader Shah and Karim Khan Zand. Nader Shah exiled 3,000 Bakhtiari families to Khorassan after quelling a rebellion in the territories. Many of them were drafted into the army and the cavalry and were used in his military campaign against India. A notable cavalry commander in Nader's campaign in Ghandahar during May and June of 1746 was Ali Saleh Khan whose bravery was noted in citations issued by the king. Even today, a Bakhtiari branch of the tribe exists in India being the remnants of those soldiers and commanders. Throughout their colorful history, Bakhtiaris had frequent clashes with the central governments in general, and the provincial governors in Isfahan, in particular. Several of the Principal Khans were murdered or put in chains by the ruling monarchs just because they had become too powerful and seen as threats to the rulers- even though the Bakhtiari Khans never had any designs for the control of the country or the Throne. These tribal chiefs were autonomous rulers in their own territories who did not fear reprisals from the government forces. Their men were armed and experts in mountain warfare especially in their own harsh and mountainous terrain. A handful of sharpshooters could close a mountain pass and stop an army coming through for days. Those Khans, who were arrested and eventually put to death, were captured through conniving and double crossings of the emissaries of the monarchs or the Governors and not through battles with the government forces. City dwelling was against the nature of these free and proud men. A Bakhtiari man held two possessions very dear to his heart and almost sacred. One was his horse, and the other, his gun. One could not imagine a Bakhtiari behind a desk instead of riding on his horse and holding a rifle. The kings and the governors had basically left them alone to remain de facto rulers of the vast territories of Bakhtiari country and were content in receiving annual taxes which the tribal chiefs collected and sent either to the governor in Isfahan or to the central government in Tehran. However, if the chiefs were late in sending in the taxes, no tax collector would be foolish enough to venture into the territories to collect. The most important and lasting confederation of the Bakhtiari tribes can be seen in late 19th century when Hossein-Gholi Khan succeeded in its formation through overwhelming backing and loyalty of the Haft Lang Khans and Kalantars. He also succeeded in defeating his adversaries in both Haft Lang and Char Lang with the help of his brothers and other allies; he purchased vast estates in Chahar Mahal and Khuzistan. The central government at the same time bestowed on him the position of Ilbagi in 1862 and Ilkhani in 1867 and exempted him from payment of taxes. His ever-increasing popularity and influence eventually caused the Court in Tehran much apprehension. Rumors and allegations of his ultimate desire and plans for taking the Crown prompted Nasser-al-Din Shah in ordering his son Zell-ol-Soltan the governor of Isfahan, to put the Ilkhani to death. He was killed at the Governor's mansion in 1882 and his two sons imprisoned. 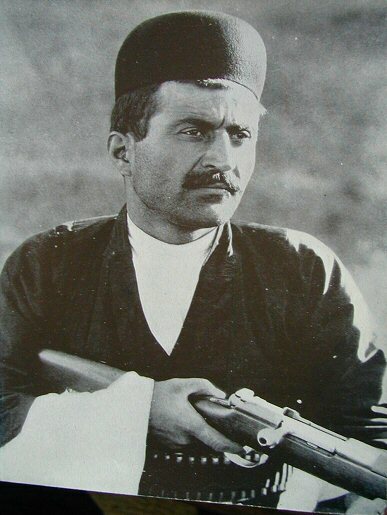 A typical Bakhtiari fighter. Reproduced from "Grass"
When Ilkhani's eldest son, Esfandiar Khan (Sardar Asad the 1st) was freed from prison after 7 years of confinement, he forged a short-lived union with Sepahdar (eldest son of Haj Ilkhani) thus bringing the Ilkhani and Haj-Ilkhani branches together under a joint command. During this time the Power, influence, and wealth of the Bakhtiaris grew but the union was weakened after the assassination of Atabak who was the protector of Esfandiar Khan and finally with the death of Esfandiar Khan.